Integrated Resource Development: Easy as apple pie. 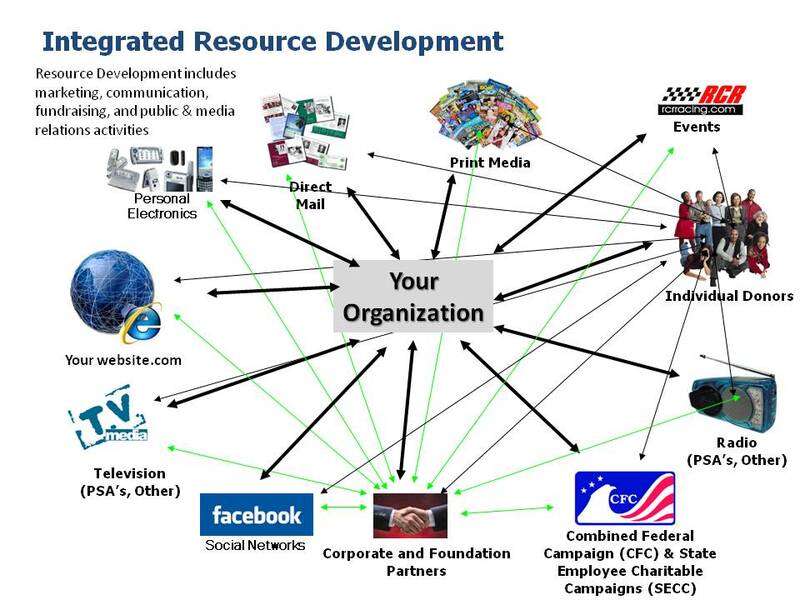 If your organizations idea of integrated resource development is not similar to the diagram above, you may need to rethink your approach. You are likely missing some great opportunities. The concept of effective resource development is fairly simple and straightforward. Implementation can sometimes be a challenge but the concept and approach itself is fairly simple. Organizations, marketers, consultants, businesses, etc…spend quite a bit of time and intellectual energy on creating super fancy and complicated theories, strategies, assumptions, conclusions, and solutions regarding the acquisition and development of resources. In other words, a great deal of time, effort, energy, and money is spent on figuring out the newest, greatest, and most successful way to raise revenue. At the end of the day, it all boils down to awareness and relationships, with the emphasis on relationships. More on that another time. Rule #1. Funding follows awareness. Rule #2. People don’t give to or support an organization unless they know what it does and can relate to it or its mission at a personal level. Rule #3. Realize that it is that simple… If the concept is not clear, refer back to Rule #1 and follow the rule sequence until it sticks. That’s it. Conceptually, it’s simple. To effectively and successfully implement, that’s another story. Funding follows awareness and people give to organizations that they know about and can personally relate or have a personal connection to it, to its mission, or both. The impetus is on the organization to communicate its mission and message consistently and effectively to its constituents and target audiences using various and available vehicles and mediums. It is in the awareness and “getting the message out” where most organizations, and businesses for that matter, have the hardest time and thus seem to have significant activity but no productivity or success. I call the activity with no productivity, white noise. The key is establishing & creating effective methods and tactics for deploying the organization’s message. There is also an essential ingredient that without, the best and most creative tactics in world will be rendered wholly ineffective and failures. That ingredient is knowledge of the targeted audience…which is another subject for another time. Raising revenue can be very difficult even with the best message, mission, or service. So many factors come into play that it is sometimes very hard to pinpoint one specific cause or another for the successes or failures of a particular program, promotion, or campaign. Usually it’s a combination of many. What I can tell you it that everything takes time, trial and effort, consistency, and a hefty amount of tenacity. You can’t harvest apples from a tree if you only planted the seed yesterday. Conceptually, it’s easy: dig a hole and plant a seed. However, keeping it alive and helping it grow is another story. It takes time for the tree to grow. But if you take care of it and do the things no one likes to do like watering, fertilizing, pulling weeds around it, pruning, spraying for bugs, you know, the non-flashy stuff, oh at the apples you’ll have…and the pies that go with it. Or…you won’t. The tree will die, despite all of the effort put into it, and no apples. Interesting how the same care can be given to two trees and one dies while the other flourishes. Makes you go, Hmmm. Either way, a great deal of knowledge has been acquired…and hopefully, considered the next time someone has a craving for an apple turnover. Until next time…Keep it real. Hello, April. You blinked, didn’t you? We’re already four months into the year. Wow! Baseball is in full swing…no pun intended…and summer is almost upon us. Sorry…no April Fool’s Day here. Only Real…Radical…Relentless…Relevant TRUTH. This month we’re continuing the Spiritual Warfare series headquartered in Ephesians 6:10-18 and how the very familiar “Armor of God” passage mirrors the mission of a Marine Corps Rifle Squad. Before we get going, let’s have a quick review to break down Ephesians 6:10-18 and parallel the passage with the Mission of a Marine Rifle Squad, which is – to locate, close with and destroy the enemy by fire and maneuver and repel the enemy’s assault by fire and close combat. The “fire” we use to destroy the enemy are the weapons of God… the sword of the Spirit – God’s Word (v.17)…and prayer (v.18). The “maneuver” is fitting your feet with the readiness that comes from the Gospel of Peace (v.15). We repel the enemy’s assault with the belt of truth and breastplate of righteousness (v.14)…the shield of faith (v.16)…and helmet of salvation (v.17). “Close combat” is our interactions with others…how we treat them…and how we handle the trials of this world and the struggles of life. Last month we talked about intelligence and properly preparing for your enemy. Now, while I love the strategic component of any battle…the fun doesn’t start until shots are fired and things start blowing up. It’s okay. You can admit it. I mean, at the end of the day, where would you rather be hanging out? In the intel tent (kind of cool) or with a gun 4 stories tall, 20 ft. wide, 140 ft. long, that takes a 500-man crew to fire two giant projectiles: a 10,584-pound high-explosive shell and a 16,540-pound concrete-piercing shell? Huh? Can you say really…really…cool? For you WWII buffs, yes, I’m talking about the German Gustav Gun…the biggest gun ever built…and one that left nothing but a 30 foot crater upon impact. This month, however, it’s about bringing out THE guns…BIG guns…I’m talking about a couple of MOAG’s, brother – Mother Of All Guns…guns way bigger than Gustav’s…and infinitely more powerful. The weapons of protection or the “armor” listed in the passage: the belt of truth…breastplate of righteousness…and helmet of salvation are essential components of a Servant Warrior’s battle gear. Add the shield of faith and you have donned and equipped yourself with THE most sound and protective set of body armor…ever. But the “destroy the enemy by fire” is accomplished when we deploy THE most formidable weapons…ever. What are they? Faith filled prayer and the sword of the Spirit…God’s word. Together they are the ultimate “Shock and Awe”! What does the Bible say about prayer and its power? “Therefore I tell you, whatever you ask in prayer, believe that you have received it, and it will be yours.”(Mark 11:24) “Is anyone among you sick? Let him call for the elders of the church, and let them pray over him, anointing him with oil in the name of the Lord. And the prayer of faith will save the one who is sick, and the Lord will raise him up. And if he has committed sins, he will be forgiven. Therefore, confess your sins to one another and pray for one another, that you may be healed. The prayer of a righteous person has great power as it is working.”(James 5:14-16). Faith-filled prayer…like the sharpest axe in the world…is awesomely effective when swung. And finally…the inerrant and inspired word of the Almighty…the infallible word of God… the sword of the Spirit…the Bible. “For the word of God is alive and active. Sharper than any double-edged sword, it penetrates even to dividing soul and spirit, joints and marrow; it judges the thoughts and attitudes of the heart.”(Hebrews 4:12) “For no word from God will ever fail.”(Luke 1:37). “All scripture is God-breathed and is useful for teaching, rebuking, correcting and training in righteousness, so that the servant of God may be thoroughly equipped for every good work.”(2Tim 3:16-17). Couple the Bible’s tactical effectiveness and its source of intelligence that is 100% reliable…100% relevant…100% accurate…100% available real-time…and you have the weapon of all weapons to take into battle…every day…and be GUARANTEED victory. Amen! Until next time, Warrior, keep it Real…Radical…Relentless…Relevant…and Armor Up. The above article appeared in the April 2013 edition of Power Source Magazine and can be viewed HERE.